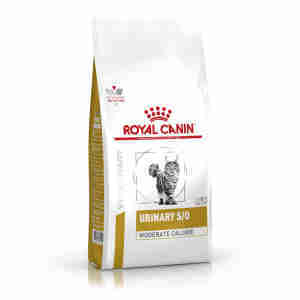 Royal Canin Feline Urinary S/O Moderate Calorie dissolves struvite and calcium oxalate stones and helps to prevent their recurrence. Royal Canin Feline Urinary S/O Moderate Calorie uses a controlled level of vitamins and nutrients to help prevent the formation of bladder stones. Undersaturated urine provides the perfect environment for crystals to form in; Feline Urinary S/O Moderate Calorie dilutes and acidifies your cat’s urine to prevent crystals recurring. If your cat has struvite or calcium oxalate stones, Feline Urinary S/O Moderate Calorie's low magnesium formula could help to dissolve them. Bladder stones block your cat’s urinary tract, making it painful for them to relieve themselves and causing them and their bodies stress. Feline Urinary S/O helps to relieve stress on the urinary tract by dissolving crystals and preventing future formation. This food is packed full of antioxidants, potassium citrate and omega-3 fatty acids to help support their urinary tract and get them back on track. With a moderate calorie content, this food is perfect for helping your cat maintain a healthy weight. calorie controlled to help your pet maintain a healthy weight. Urinary problems such as struvite and calcium oxalate stones can be hard to diagnose as your cat may not show any obvious symptoms. If you think your pet might have a problem with their urinary tract there are a few things you can look out for: abnormal urine patterns, difficulty urinating and bloody or cloudy urine are all common symptoms of infection. You should consult your vet for a complete diagnosis. Because veterinary diets are formulated for the nutritional support of pets with specific clinical conditions, we recommend that you only use them under professional advice. For more information on feeding Royal Canin Feline Urinary S/O Moderate Calorie to your cat, please consult your veterinary surgeon. Dry food composition: dehydrated poultry meat, rice, wheatgluten*, maize flour, vegetable fibres, maize gluten, minerals, animal fats,hydrolysed animal proteins, fish oil, soya oil, fructo-oligo-saccharides, eggpowder, hydrolysed crustaceans (source of glucosamine), marigold extract(source of lutein). ADDITIVES (per kg): Nutritional additives: Vitamin A: 22300IU, Vitamin D3: 500 IU, E1 (Iron): 41 mg, E2 (Iodine): 3.2 mg, E4 (Copper): 6mg, E5 (Manganese): 54 mg, E6 (Zinc): 177 mg, E8 (Selenium): 0.07 mg -Preservatives - Antioxidants. ANALYTICAL CONSTITUENTS: Protein: 34% - Fatcontent: 11% - Crude ash: 9.1% - Crude fibres: 7% - Calcium: 1.02% -Phosphorus: 0.99% - Sodium: 1.1% - Chloride: 1.89% - Potassium: 1% - Magnesium:0.05% - Sulphur: 0.5% - Total taurine: 0.21% - Urine acidifying substances:calcium sulphate (1%), DL-methionine. *L.I.P. : protein selected for its veryhigh assimilation. Wet food composition: dehydrated poultry protein, rice,wheat gluten*, maize flour, vegetable fibres, maize gluten, minerals, animalfats, hydrolysed animal proteins, fish oil, soya oil, fructo-oligo-saccharides,egg powder, hydrolysed crustaceans (source of glucosamine), marigold extract(source of lutein). ANALYTICAL CONSTITUENTS: Protein: 34% - Fatcontent: 11% - Crude ash: 9.1% - Crude fibres: 7% - Calcium: 1% - Phosphorus:0.95% - Sodium: 1.1% - Chloride: 1.89% - Potassium: 1% - Magnesium: 0.05% -Sulphur: 0.5% - Total taurine: 0.21% - Urine acidifying substances: Calciumsulphate: 10 g/kg - DL-methionine. *L.I.P. : protein selected for its very highassimilation. I have always been impressed with way your website is very accessible. It is clear and easy to find the products you need. Ordering is straight forward and having the sections about your previous orders, your account and re ordering. From ordering to delivery is very quick. A very efficient site. Only the best for my cats!!!! Since more than 8 years this is the favourite food for my cats. I have tried other brands but this one is definitely the best! Not only my cats trust Royal Canin but I do too! Quality, healthy and tasty!!!! Brilliant food for my cat who had urinary problems, he loves it.